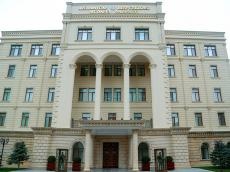 On the instructions of the President of the Republic of Azerbaijan, Supreme Commander-in-Chief of the Armed Forces, Mr. Ilham Aliyev, the Open Doors Day is being held today for parents and relatives of soldiers in all military units of Azerbaijan Army on the eve of the Novruz holiday. The event is held to enhance public control, ensure transparency, strengthen unity between the army and the people, improve the fruitfulness of working with families of soldiers, the Azerbaijani Defense Ministry said March 17, Trend reports. Within the scope of the events, the relatives of soldiers and members of the public are getting acquainted with the housing and living conditions created in military units, as well as visiting official, administrative buildings, soldiers' barracks, and mess halls. During the Open Doors Day, it is planned to hold meetings of the command of military units with parents, during which all issues they are interested in will be discussed. The concert programs and other cultural events on the occasion of Novruz holiday will also be organized.